He's Not The Palestinian President, But He Played One On TV : Parallels A 24-year-old Palestinian who was elected "president" on a TV reality show gets peppered with policy questions by his fans. It's a sign of how hungry Palestinians are for delayed real elections. Waad Qannam (left), 24, won a reality TV show called The President, in which the audience, instead of choosing its favorite singer, chose its favorite would-be leader. He is the closest Palestinians have come to electing a leader in more than a decade. The streets are packed on a recent Saturday afternoon in Ramallah, the seat of the Palestinian government in the West Bank. As he weaves through the families and shoppers, 24-year-old Waad Qannam is the center of attention. Dana Adiq, 27, stops Qannam to call him "strong, cultured and intellectual." Tasneem Hushiyea, who is 25, asks for his plans to help young Palestinians. And 23-year-old Annas Karoty addresses him by his title: "The president of Palestine." Qannam smiles brightly, but also a little bashfully. He's not the real Palestinian president. He just played one on TV. In June, he won a TV show called The President, a reality show similar to American Idol. But instead of voting for its favorite singer, the Palestinian audience voted via text message for its favorite would-be leader. Qannam beat out a diverse mix of 23 other contestants, who held election rallies and critiqued sitting ministers. He is from East Jerusalem, which Palestinians hope will be the capital of a future state, and is the son of refugees — two traits he says made him popular in the West Bank. Mohannad Samara, a self-described Islamist, says young people are frustrated with a lack of voice in the Palestinian political process. He fears Hamas and other Islamist groups — and their young voters — won't be allowed to fully participate in the Palestinian elections scheduled for Oct. 8. When he won, he dropped to his knees and cried. "I felt that that moment was the key to giving the youth a chance to participate in Palestinian politics," Qannam says. The show, broadcast on the Maan satellite network, was popular — and he is recognized on the streets of Ramallah — in part because he's the closest Palestinians have gotten to choosing a leader in more than a decade. The real president of the Palestinian Authority, Mahmoud Abbas, was elected in 2005 for what was supposed to be a five-year term. "The program The President sends a very strong message to the [Palestinian] leadership and says, there is a real need for the democratic process," Qannam says. "The second message that it gives is the interest on the part of the youth to participate in making their ideas heard." Seventy percent of Palestinians are under 30, according to the Palestinian Central Bureau of Statistics, and many describe themselves as politically starved. They're frustrated not only by a lack of elections but also by a lack of political and economic development. Some accuse the Palestinian leadership of being focused only on keeping itself and its closest supporters in power. Those age 18 and older will get their chance to make their voices heard Oct. 8. That's when Palestinians are scheduled to hold their first contested elections in 11 years. They will choose 416 spots on local councils, which help elect mayors and other local officials and help administer services such as power and water. As of now, the election will include both major parties — Fatah, which largely runs the Palestinian Authority from Ramallah, and Hamas, which runs the Gaza Strip and is considered a terrorist organization by Israel and the United States. But there are no plans for either a Palestinian legislative or presidential election. Karoty, who met Qannam during the show's taping and considers him a friend, calls the current Palestinian leadership out of touch. "It is time for us to get rid of people who have been sitting for years and have not done much for the people," Karoty says. "Concerning the ones that have been keeping their seats as mayors and others for many, many years, we want to get rid of those people." Qannam — perhaps trying out a politician's answer — is more diplomatic. "We do not seek to cancel the role of the older generation," says Qannam, who is a member of Fatah. "We rather want to encourage our role, to find a role for us." He says he met with Abbas and urged him to install a quota among the municipal representatives for young members. He says he has not heard back. "The only time that I will feel that the youth have an impact in Palestinian politics," Qannam says, "is when I see the youth of Fatah or other parties playing a practical role in the running of the affairs of the country." In the nearby Amari refugee camp, 29-year-old Mohannad Samara doubts that will ever happen. Between customers at his mirror and glass shop, he explains that he's an Islamist and fears that Hamas and other Islamist groups won't be allowed to fully participate. "The Prophet Muhammad said our victory comes through the engagement of the youth," Samara says. "But if Islamist youth gets engaged in the upcoming elections, they will either get arrested or cornered." He believes the Palestinian Authority, run by Abbas, and Israel will team up to block young Islamists, either by preventing them from voting, arresting their members or not respecting the results of the vote. "It will be the first and foremost the Palestinian Authority that will block the youth," he says, "and whatever the Palestinian Authority cannot carry out on its own, Israel will do it for them." 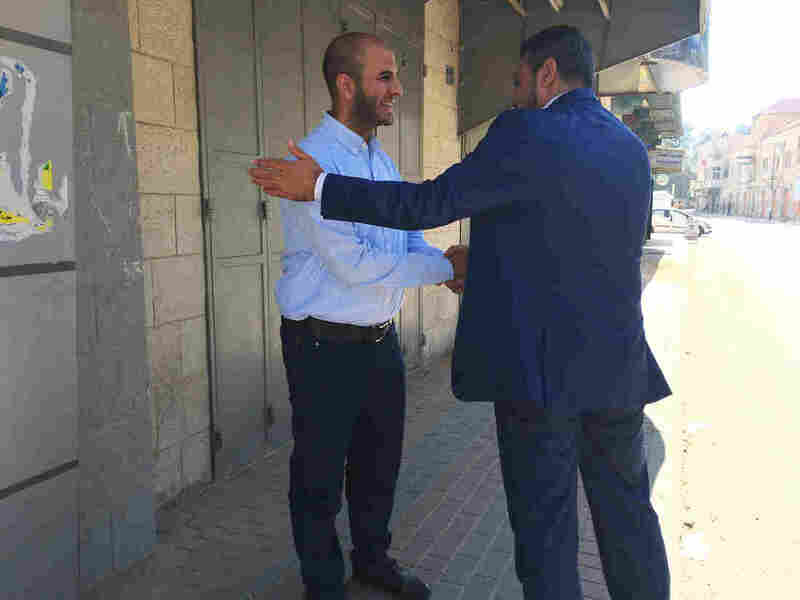 On Wednesday morning, Israel's internal security services announced it arrested Hamas' election committee representative, accusing him of being a threat to local security. Hamas accused Israel of trying to influence the election. Qannam is trying to fight youth cynicism. 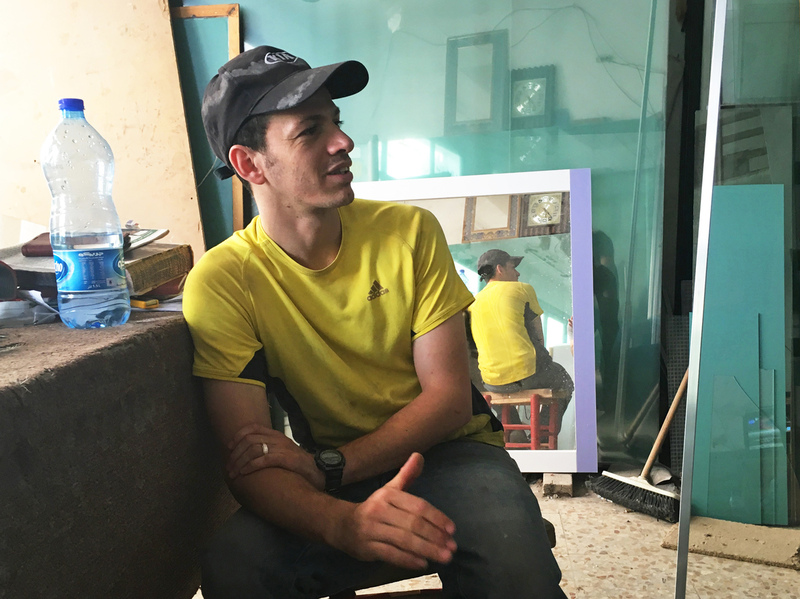 He stands in a group of young Palestinians in Ramallah, and 16-year-old Jihad Adnan asks him how he will increase youth participation in politics. Qannam tries to convince them their voices will be heard. He is only a few moments into his pitch when he's interrupted by Hushiyea. She says she is desperate to talk to any leader, even a TV president. She challenges Qannam and asks how he could prevent nepotism. Qannam seems prepared for that question. "The only way to deal with the issue of nepotism," he says, "is to make Palestinian institutions bigger and put the right person and the most qualified person in that job." He smiles and admits he might even run himself. The audio version of this story states that Waad Qannam won The President last year. He won the show in June of this year.